THE DIVINE LIGHT Mission of Guru Maharaj Ji, 15-year-old Perfect Master and Revealer of Truth, is encountering some earthly difficulties. It faces a bill of £45,000 for last weekend's three-day festival of peace (and occasional rock music) at London's Alexandra Palace. Only £90, however, was received in donations from the thousands who attended. The cult has also attracted the attention of the Charity Commissioners, who this week begin an inquiry into the Mission's general finances in Britain. And in India, birthplace of the Guru, officialdom is equally unfriendly: the Government is investigating the Mission and is keeping a "close watch" on its expensive way of life. The Alexandra Palace festival, with the Guru perched high amid the organ pipes of the Great Hall, was the culmination of a remarkable year for the Guru. His followers have turned out in their thousands; and his own life-style, with his fondness for life's little luxuries such as the new £20,000 Mercedes car bought for him last week by British devotees, private planes, "Divine Residences" and motorbikes, has made him one of the summer's celebrities for the unbelievers, too. "To advance religion in accordance with the principles of Sri Hans Ji Maharaja and Sri Santa Ji Guru Maharaj by promoting the knowledge that God is the supreme creator of the Universe; the realisation of God without nominational bias; the relief and prevention of suffering, both mental and physical, occasioned by poverty, ill-health and the abuse of drugs." In the year or so that it has been operating in this country the Mission has acquired a "Divine Residence" in London costing £25,000, for the sole use of the Guru and his "Holy Family" on their occasional visits; an Odeon cinema in Southeast London for £65,000, in which to hold prayer meetings; and the Mercedes, which has replaced a Rolls. There is also the outlay on the Peace Festival. 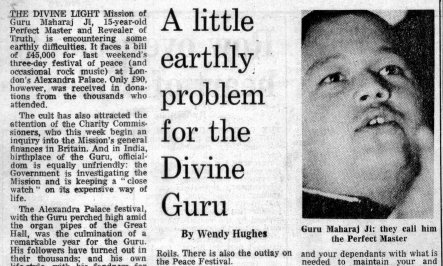 According to Peter Potter, the accountant for the Mission, and Glen Whittaker, general secretary and trustee, the money has mostly been provided by donations - "dedications" - by Britain's 7,000 followers of the Guru. Apart from the 300 followers who live in community homes (Ashrams) and turn over their pay packets, it is said that only 10 per cent send regular contributions. Mr Potter says: "We have been saving hard for more than a year and it is not difficult to get this amount of money if you scrimp and save." But they had to have a £30,000 short-term loan in order to buy the cinema. The Mission also receives a regular income from Divine Sales - mainly of second-hand goods given by the faithful - and from the sale of its Divine publications. "As much you surrender of what you are holding, as much is returned to you in richer currency … Everything in excess after you have provided yourself and your dependants with what is needed to maintain your and their usefulness to Maharaj Ji, dedicate it each week to the Centre Ashram of your country … Hold a lot back and He must hold a lot back." Followers were also told: "Do not fall into the maya [illusion] of ego thoughts, thinking, 'I want to have some say in how my money is being spent,' or doing something else with your money … both these thoughts are terrible traps." A spokesman for the Charity Commission said last week: "Just because they are registered, that does not mean that we approve. It does not indicate that the Commissioners have checked them as a bona fide charitable organisation." In fact, any person or organisation presenting an acceptable Trust Deed may become registered as a charity. And there is no duty to provide accounts to the Commissioners unless they are specifically requested. Although the Guru had been expected to leave Britain early last week, both he and his entourage were still in London yesterday. Glen Whittaker commented: "The two most unpredictable things, are the weather and the Guru."